“In 2003, House of Raeford worker Bruce Glover died after a leak sent chlorine gas seeping into the company’s Rose Hill plant. The next year, a major ammonia leak at that plant forced a large-scale evacuation and sent 17 workers to the hospital with respiratory problems and burning throats. N.C. OSHA cited the company for chemical violations after each of those accidents – and each time agreed to slash the proposed penalties. After these incidents and before the most recent inspections, the House of Raeford had been fined $117,000 but was able to whittle those fines down to $26,500. Unfortunately, negotiating OSHA fines down has become common practice in recent years, a practice that does little to discourage irresponsible companies from engaging in repeat violations. “Our team of reporters and editors spent 22 months interviewing more than 200 poultry workers throughout the Southeast and analyzing industry documents. Their investigation soon led them to focus on one of the largest Carolinas-based poultry producers, House of Raeford. Its eight plants have been cited for more serious safety violations than all but two other poultry companies in recent years — and more than some companies several times their size. Our journalists found evidence that House of Raeford has failed to report serious injuries, including broken bones and carpal tunnel syndrome. They discovered that plant officials often dismissed workers’ requests for medical care that would cost the company money. They also found that House of Raeford has undergone a work force transformation. In the early 1990s, its workers were largely African Americans. Today, between 80 percent and 90 percent of workers at some of its plants are Latinos. Most have no legal standing in this country; most are poor. It’s difficult reading on the eve of the day when most of us prepare to enjoy a turkey feast tomorrow, but if not now, it’s worth a bookmark for reading at a later time. We commend the Charlotte Observer for their reporting. When corporate social responsibility fails and when public policy enforcers are weak, it’s important that someone take up the banner for worker and public safety. Ohio: Severed Joint and Several? There are a number of ways to purchase workers comp insurance: most companies secure stand-alone policies. Under experience rating, if the company has losses, their costs go up; if they have lower than average losses, they benefit from reduced premiums. Some companies join with others to form a self-insurance group (SIG), where individual companies are no longer in charge of their own destiny. Group performance determines future costs. Needless to add, it’s important to limit group membership to companies fully committed to good loss controls and to proper management of injured employees. The shared liability for losses is known in the insurance world as “joint and several liability.” There is some risk involved: one company might be loss free, but the losses of other companies in the group could still drive up the cost of insurance for all. Except in Ohio. Ohio has an unique set of rules for groups, which brings us to the saga of Corky & Lenny’s, a deli operating for half a century in Cleveland. Until recently, Corky & Lenny’s participated in a workers comp group. Unfortunately, they had a few claims. In most group situations, their losses would have been averaged against the performance of the group as a whole, thereby ameliorating the impact on the deli’s comp premiums. Instead, the group threw Corky and Lenny’s out of the group, forcing them to secure individual coverage. Naturally, with their recent losses factored into their premium, Corky and Lenny’s were suddently faced with a dramatic increase in costs. So they did what one of their customers would do after slipping on a stray piece of pastrami: they sued. Common Pleas Judge Richard McMonagle found merit in the lawsuit and has issued a restraining order against the Ohio Bureau of Workers Comp (BWC). Here is the problem with the BWC approach to group insurance: the bureau assesses a group’s risk at the beginning of a policy year and sets premiums based on the claims history. Members of the group are offered deep discounts. At the end of the year, group managers would toss out any members with substantial losses during the year. These unfortunate companies would take their losses with them. Instead of “joint and several” liability, the high loss companies, like Corky and Lenny’s, were suddenly on their own, facing doubled premiums. Companies remaining in the group, freed from the losses of expelled members, experienced premium reductions of 20 percent or more. As you can see, the Ohio rules really defeat the purpose of group insurance. Judge McMonagle has ruled that state law requires that the rating plan be retrospective, taking into account the actual performance of each and every group member. The BWC agrees, but they are hoping for some time to work out the details. In the interim, they have agreed to cap increases for companies tossed out of the group at 100 percent – which does not sound like a bargain, but some were facing increases substantially higher than that. Judge McMonagle has moved this unfair situation in the right direction. He deserves a nice pastrami sandwich on rye bread with a little mustard. Under ethics rules, of course, he’ll have to pay for it himself. Joe Paduda is hosting the post-election edition of Cavalcade of Risk. Dedicated blogger that he is, his post comes to us from Las Vegas, where he offers observations from the floor of the National Workers Comp and Disability Conference. Joe has been a roving workers comp reporter lately. His recent trip follows on the heels of his reports from the Workers Compensation Research Institute Annual Meeting, where he offered his analysis of the best presentation, along with other posts from the conference that you might want to read. Health care reform – The health care bloggers and pundits are weighing on on the announcement that Tom Daschle has been named as Health and Human Services Secretary. Ezra Klein says that he was picked because he has the skill set to get health care plan through Congress; Jonathon Cohn talks about his likely approach, and Bob Laszewski of Health Care Policy and Marketplace Review offers his thoughts on the Daschle pick. And for those who are still on the fence about the necessity of health care reform, Sarah Rubenstein of the WSJ Health Blog reports that under PPOs, the the most common type of insurance offered by employers, health care deductibles doubled to $1,000 in 2008, according to a recent survey by Mercer. When insurers bite the dust – What happens to workers compensation claims when an insurance company goes bankrupt? Ronald Ryan of Michigan Workers’ Compensation Law blog discusses how this situation is handled in Michigan. State laws differ. Questions about bankrupt insurers are weighing heavily on the minds of employers and claimants lately. We’ve talked about what happens in the case of insurer insolvencies before, as well as employer bankruptcies and comp. The Insurance Information Institute provides an excellent overview of insurer insolvencies and state Guaranty Funds – a page you might want to bookmark, given the times. Guns at work – While there likely won’t be a decision until next year, the NRA and Oklahoma employers squared off yesterday in federal appeals court in Denver on the issue of guns at work in Oklahoma. These types of laws pit the rights of gun owners against the rights of private property owners – in this case, employers – to control their own property. The Oklahoma law forbid employers the right to bar employees from keeping guns in locked cars on their property, but a district court issued a permanent injunction against the law’s enforcement on the basis that the law was preempted by employer obligations to maintain a safe workplace under the Occupational Safety and Health Act. Michael Fox of Jottings By an Employer’s Lawyer discusses yesterday’s court proceeding. He sees the potential for the law of unintended consequences to come into play in relation to the interpretation of the General Duty Clause of the Occupational Safety and Health Act, which could increase exposure to OSHA violations for other employers. For more, see our background on this case as the issue evolved. Safety sensitive employees – When it comes to safety, can you require physicals of all employees? Attorney Lindsay Harris offers tips on periodic medical exams for safety-sensitive positions HR Daily Advisor. There is a fascinating article in today’s Wall Street Journal (subscription required) that raises interesting implications for workers compensation. Melinda Beck writes that warning labels on medications can actually stimulate symptoms, especially when stress is involved. In other words, when an injured employee reads a warning label – “this medicine may cause vomiting, headaches, drowsiness, etc” – he or she is more likely to have these symptoms. The label itself creates a self-fulfilling expectation. Doctors call this the “nocebo” effect, a phenomenon parallel to placebos. “People’s expectations play a very important role in how they react to medications,” says Richard Kradin, a physician and psychoanalyst at MGH in Boston. He notes that 25% of patients who get completely inert placebos in clinical trials complain of the listed side effects – usually headaches, drowsiness and dizziness. The implications for workers comp are profound: experiments have shown that telling patients they may feel pain triggers the release of neuropeptide cholecystokinin (CKK), which heightens pain sensations. Because work-related injury almost always involves pain, the expectation of pain can make the pain felt by the patient even worse. This phenomenon may help explain the inordinate dependence upon strong narcotics in the workers comp system (a frequent Insider focus). We all dread pain. Injured workers have a heightened awareness of pain relating to their injuries. They bring this awareness to the examination table. In their efforts to alleviate (real and imagined) pain, doctors tend to reach for stronger-than-necessary medications in order to provide the relief their patients demand. Stress is a key factor in the nocebo effect. Stress drives the anticipation of pain and the over-reaction to medication warnings. It is present in virtually all workers comp situations, so we can project that the nocebo effect is a fairly constant factor in the treatment of work-related injuries. The article points out the importance of good communication between doctors and patients. Doctors need to focus not just on information (“this medicine might really make you sick”) but on the need to maintain contact: “If you have any problems or concerns, don’t hesitate to call me.” Reassurance from a doctor can literally reduce the amount of pain and stress experienced by the patient. Daniel Moerman, a professor of anthropology at the University of Michigan says that “physician communication with patients is the closest thing to magic. It gets communicated in incredibly subtle ways – a flash in the eye, a smile, a spring in the step.” Doctors, in other words, are shamans. Their ability to heal is not limited to the medications and treatments they prescribe. They can heal just by conveying a strong belief in their ability to heal. APOLITICAL FOOTNOTE: Let’s take the nocebo concept one step further. The election of Barrack Obama as president may have as much to do with his calm presence as his politics. He has a reasurring coolness in a time of transcendent stress. His body language communicates a confidence in his ability to solve problems. His Marcus Welby-esque manner conveys the notion that our imploding economy can indeed be fixed and our wounded world can eventually be healed. Florida employers have seen about a 60% rate decrease since the 2003 workers compensation reform but it looks like all that is about to change. NCCI has just filed for an 8.9% Florida rate increase in the wake of a recent Florida Supreme Court ruling. This is an enormous change, particularly in light of the 18.9 percent decrease that had been proposed prior to the ruling. Why such a giant leap? In Murray v. Mariners Health/ACE USA, the court struck down a cap on attorney fees, which had been a hallmark in Florida’s 2003 workers compensation reforms. Hourly legal fees were eliminated and replaced with contingency fees capped at 20 percent of the award. The study revealed that defense attorney expenses were also the highest in Florida at more than $2,600 per claim – three times higher than Connecticut, the study state with the lowest expenses. There must be something in the smoke: a few months ago we blogged the tale of Albert Arroyo, a Boston firefighter who participated in a body building contest while collecting workers comp for an alleged disability. Well, to demonstrate that we harbor neither geographic nor gender prejudices, we tell the tale of Christina Hijjawi, a 37 year-old firefighter from San Francisco. Christina had two work-related problems: an injury to her right shoulder fighting a blaze in December 1998, which left her either off work or assigned to desk duty. Then two years ago, Hijjawi reported suffering a second injury – this one to her right thumb. The thumb problem apparently precluded the performance of her light duty assignment and put her completely out of work. Unlike Mr. Arroyo, who turned to bodybuilding as part of his rehab effort, Christina became an endurance athlete. From 2001 to 2006, according to records on the Web site Athlinks, Hijjawi ran in no fewer than a dozen marathons. And her biography on another site shows she was taking on even bigger challenges, including the Canada 2005 Ultraman super triathlon competition – in which competitors swim 6.2 miles, ride a bike for 170 miles and run 52 miles, twice the distance of a marathon. Yikes. It took more than than 33 hours to complete the Ultraman. In June 2006, she took part in the 50-kilometer Mount Diablo summer trail run, where participants go from the base to the summit of the 3,800-foot Contra Costa landmark and back – and then do it again. Athlinks says she clocked in at eight hours and 31 minutes. Heck, her thumb might be bothering her, but you’d have to rate her aerobic capacity as somewhat above average. Hijjawi’s attorney, Christopher Shea, cautions us from jumping to conclusions. “There’s a big difference between competing in a triathlon and running into a burning building with a 150-pound hose.” Good point. Just because she can run up a mountain- twice – doesn’t mean she can perform the essential functions of a firefighter (including sitting at a desk on light duty). Lurking in the shadows of these two dubious disability claims lies the medical profession: somewhere along the line a doctor certified – and recertified – that Hijjawi was unable to perform even light-duty work. This diagnosis was blindly accepted by Christina’s employer, the San Francisco fire department, which failed to manage her back to productive employment. Taxpayers foot the (substantial) bills for the unproductive lifestyles favored by Arroyo and Hijjawi. In these trying times, we need a much higher level of accountability – starting with the President of the United States and moving down to the public servants who patrol our streets, collect our trash, respond to emergencies and teach our children. They are all our employees and we need to make sure they are performing their jobs to the highest standards. Louise has posted “The Election Is Over” edition of Health Wonk Review at Colorado Health Insurance Insider. Now that voters have made their choices and the dust is settling, many wonkers are opining about how health care reform is likely to take shape. Also of note: various posts discuss the ways that advanced technologies are increasing the cost of health care. It’s a good edition, check it out. Our next issue falls on Thanksgiving, so HWR won’t be back until December 11 – get your fill on policy issues now! 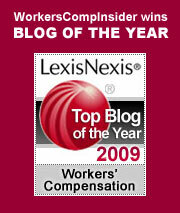 Here are two items you might never expect to appear together: frozen embryos and workers comp. But a case in Arkansas reveals that the comp system can easily be drawn into the ongoing (and apparently endless) debate of when life begins. Wade and Amy Finley were married in 1990. They were unsuccessful in having children, so in 2000 they initiated infertility treatments. They froze several embroyos as part of this effort. In July of 2001, Wade was killed in a job related accident. In accordance with Arkansas’s comp statute, Amy received survivor benefits. In June of 2002, nearly a year after Wade’s death, Amy had the previously frozen embryos emplanted in her womb. Wade Jr was born in March of 2003. Amy immediately filed for comp dependency benefits on behalf of her newborn son. Her claim was initially declined, then allowed, and then brought before the Arkansas Supreme Court. The court defined the problem as follows: Does a child, who was created as an embryo through in vitro fertilization during his parents’ marriage, but implanted into his mother’s womb after the death of his father, inherit rights under Arkansas comp law? Amy asserted that the child was Wade’s and as such was entitled to dependency benefits. The workers comp commissioner argued that Wade Jr was neither born nor conceived during the Finley’s marriage, which ended upon Mr. Finley’s death. It is clear from the statute that in order to inherit through intestate succession as a posthumous descendant, the child must have been conceived before the decedent’s death. However, the court points out that the statutory scheme fails to define the term “conceived.” Was the merger of cells in a petri dish – followed almost immediately by freezing – a conception? Was that microscopic event the beginning of life? Ultimately, the court did not buy Amy’s argument. The justices state that their role “is not to create the law, but to interpret the law and to give effect to the legislature’s intent.” Arkansas statutes do not specifically define the petri dish merger as a “conception.” Wade Jr is the child of his father (whom he sadly will never know) and the dependent of his mother. But he is not a dependent as defined for workers comp purposes and as such does not qualify for benefits. Amy was certainly within her rights to have Wade’s child after his death. The state is apparently within its rights to preclude dependency benefits for the child. The court punted on the issue of when life begins, leaving that sticky question for the state legislature. I recommend against their trying to resolve it once and for all. Because AIG has been at the epicenter of the economic earthquake, many non-industry observers point to insurance as one of the villains and the industry is getting a black eye that may not be warranted. AIG’s problems did not surface in its insurance operations, which remained sound, but with their dubious investment portfolio which rocked the entire organization. Not that insurance companies mightn’t have gotten in more trouble if left to their own devices, but the nature of the beast is that the industry operates in a highly regulated environment, both a blessing and a curse. In this case, more of the former. That being said, just as a rising tide raises all boats, a lowering tide will affect all boats, too. One of the anticipated after-effects of the financial crisis will be an increase in regulation. Another is that the current economic downturn likely signals the bottom of a soft market. Buyers can expect a hardening of prices. Insurers depend on investment income. Currently, investment returns are going down as claim costs are going up due to inflationary pressure – that leaves only one place for prices to go. Market Scout: “The financial markets have experienced a meltdown, several major insurers are in serious trouble, underwriting results are slipping and investment income is anemic at best. As a result, the soft market is winding down.” – see the accompanying charts. During recent earnings conference calls, Evan Greenberg, chairman and CEO of ACE Limited and AXIS CEO John Charman both agreed that a hard market is in the making. OK, what can a buyer do when faced with likely price increases? Some of the same things that a homeowner does in anticipation of foul weather: Tighten things up and go back to the basics. Be aggressive about preventing all workplace injuries and about managing any injuries that do occur. Strengthen your provider relationships. Tighten up your return-to-work programs. It’s our experience that when rates are low, workers comp can slip as a priority and get moved to the back burner. If it isn’t there already, it’s time to move workers comp back to the front burner. Cavalcade of Risk #64 is posted and awaiting your perusal at SuperSaver. Violence at work not always compensable – Roberto Ceniceros of Business Insurance reports on an Alabama Supreme Court ruling that sided with a lower court in denying workers comp benefits to a Burger King manager who was sexually assaulted as she arrived at work and was unlocking the restaurant. A random or neutral act of violence is generally not compensable, even if it occurs in the workplace. To be compensable, injuries must “arise out of and in the course of employment.” Injuries can occur “in the course of employment,” which generally relates to the time, place and circumstances, while not meeting the “arising out of the employment” standard, which generally refers to the work-relatedness. If the act of violence had been perpetrated by a co-worker or was directly related to the discharge of duties – such as an assault to a convenience store clerk during a robbery – the injury might be deemed compensable. Victims of random violence might have other redress through civil suits, but generally not through the workers compensation system. Employment law issues in the new administration – With the recent change in guard, it is likely that there will be some measure of labor and employment law reform in the near future. Paul Secunda of Workplace Prof Blog offers his suggestions for four broad areas of employment law reform that should be addressed: labor rights, workplace anti-discrimination and civil rights, employee benefit rights, and public employee rights. Pre-election, John Phillips of The Employment Law Post looked at a half dozen pending bills related to employment law and Michael Fox of Jottings by an Employers Lawyer added his thoughts on pending employment law issues.